If you own a KitchenAid stand mix﻿﻿﻿e﻿﻿﻿r, you know that it can do a lot more than just mixing the bread and cookie dough. Thanks to a variety of KitchenAid attachments, you can easily make a variety of dishes you have ever thought of. Using one of these best KitchenAid attachments featured below can quickly turn you from a home cook to a 5-star chef who can make various delicious delicacies. The KitchenAid attachments range from some practical attachments such as grinder/slicer/shredder set to some fun add-ons, like the ice cream maker. While it is not possible for the attachments to replace every appliance present in your kitchen, they will definitely help the stand mixer earn a permanent space on your kitchen top. If you are still considering to buy a stand mixer, read this post﻿﻿﻿﻿﻿ for some good buying tips. By picking up the right KitchenAid attachments, you can use the machine to slice vegetables, grate cheese, make breadcrumbs, and make pasta, fresh juice or ice cream. So are you ready to make your KitchenAid work to its full potential? If you love using your KitchenAid for a variety of job, you will even love it for food grinding options. The KitchenAid Food Grinder Attachment is a must-have for all those who love to make sausages. Well, jokes apart, it is worth making the investment in the grinder. The cutting dies of the grinder are made up of metal, and you get both coarse and fine cutting plates. The KitchenAid food grinder is one of the must have KitchenAid mixer attachments for homemakers. Don’t we all scream for ice cream? Well, I don’t know about you, but I can eat ice creams day in and day out. This is one of my favorite attachments out of all the KitchenAid stand mixer attachments. It works well with all models of stand mixers, whether you have bowl lift or tilt head because it comfortably locks in place just like the regular mixing bowl. The 2-quart ice cream maker includes the freezer bowl, bowl adapter, drive assembly, and dasher. All the parts of the ice maker are dishwasher safe hence cleaning up is a breeze. This attachment gives you a chance to make frozen yogurt, ice cream or sorbet. You can have your favorite ice cream anytime with this KitchenAid stand mixer accessory, and if you feel like eating something lighter, you can always opt for sorbet. The KitchenAid ice cream maker is definitely one of the best KitchenAid attachments that every ice cream lover should own one. Want to make delicious ice creams? Know how to use the ice cream attachment and make delicious ice creams at home. Are you looking for commercial styled dicing of your vegetables? If yes, then pick up the KitchenAid food processor attachment. 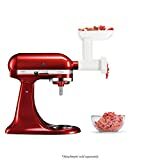 This KitchenAid accessory is compatible with all KitchenAid mixers and makes up as an excellent choice for homemakers who don’t have enough room in their kitchen to store a food processor and stand mixer separately. With this fantastic food processor attachment, you can slice, julienne, shred and dice anything you can get your hands on! From vegetables, fruits to cheese, it can help you create perfect cubes every time you use it. With the attachments mentioned above, you get a chance to create a tray with similar sized vegetable cubes or dice ingredients to include them into your soup. This is one of the latest additions to the best KitchenAid mixer attachments. While you may not find a large number of reviews, but according to some of the verified KitchenAid mixer food processor attachment review on Amazon, the customers have found it to be extremely useful. Are you a paste lover? If yes, then the KitchenAid Paste Set is the best KitchenAid attachment for you. Homemade pasta is far better than the store bought pasta and it this stand mixer attachment gives you a fun way to enjoy making a meal of spaghetti. With this amazing accessory, you can easily and quickly make ravioli, spaghetti and egg noodles. While you also have the option to buy individual pasta cutters, but investing in the set gives you a lot more option and helps you save money in the long run. So if you are ready to make some fresh pasta in the comfort of your home, make sure you invest in this fantastic KitchenAid pasta set. 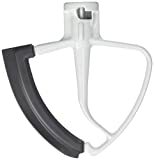 The KitchenAid flex edge beater features flexible edges that give superior scraping. It has been designed out of sturdy material which helps it stand up over time. It keeps the mess to a minimum while giving out the desired results. Its design makes it incredibly easy to clean and it can use used with any KitchenAid tilt-head stand mixer. So there you have it. All the best KitchenAid attachments that you should seriously consider to own it. So, how many of them are you planning to get your hand on? Also, make sure you know every aspect of your stand mixer and fully utilizing the mixer to its full potential. Let us know if we miss out any other good attachements that you think should include in this list by commenting below.